Campaigners call for a ‘People’s Newham’ as Robin Wales is voted out. On Saturday 17 March, Focus E15 campaigners celebrated the news of Robin Wales’ deselection by riding through the streets of Newham in a open-topped bus. The bus was draped with placards, banners and flags displaying clear political messages about the lack of social housing in the borough. 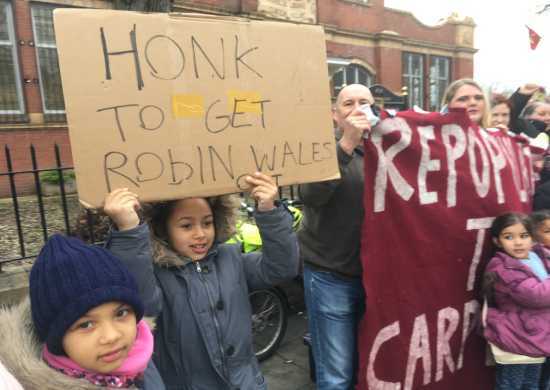 Campaigners sang out the good news that the Mayor had been deselected, chanting in unison ‘Robin Wales has gone -so long so long’ and received many thumbs up and happy waves from Newham residents amazed at the sight of a bus load of campaigners. There were many joyful beeps and hoots from supportive motorists. Back on board the bus, exhilarating live drumming kept the freezing temperatures at bay as did the constant chanting of ‘Robin Wales is Out’ all set to the sound of popping champagne corks and loud cheering. This celebratory mood is understandable as the Labour Mayor Robin Wales has been in power for 23 years, leaving behind him a rotten legacy of 1 in 25 people homeless. Focus E15 campaign has been a constant thorn in the side of Robin Wales for the past four years by protesting at the lack of council housing in the borough at many Mayoral proceedings and full council meetings, as well as leading an occupation on the boarded up Carpenters Estate back in 2014, when the Mayor was forced to issue a public apology for the way he had treated the original 29 mothers from Focus E15 hostel. However Focus E15 campaign knows full well that the fight for decent council housing does not end with Robin Wales’s deselection. 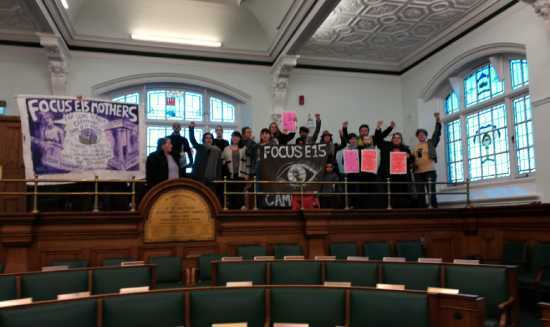 With this in mind, Focus E15 campaign is already placing demands on the Labour Mayoral candidate Rokhsana Fiaz and demanding that Carpenters Estate is saved for all existing residents and is maintained as 100% council housing. 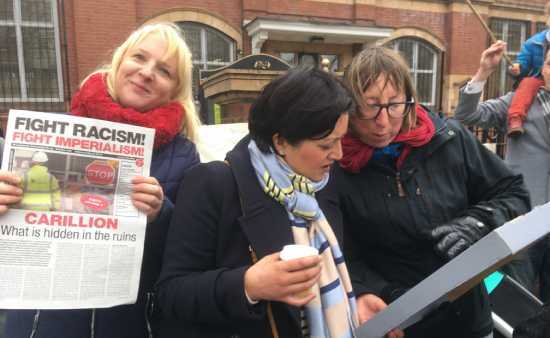 With the news of Robin Wales’ defeat, groups in Newham have started to push for a People’s Charter which has already been presented to Rokhsana Fiaz. It is printed in full below. We will continue to raise the rights of all residents of Newham and hold the incoming council and the next Mayor to account. Join us at our public meeting on 7 April at 2.30pm at Sylvias Corner, 97 Aldworth Rd E15 4DN to discuss more. If your group would like to sign the charter please send an email to focuse15london@gmail.com or send the campaign a message on Facebook or twitter @focuse15. Newham People’s Charter drawn up as Robin Wales faces deselection. Robin Wales, head of Newham Labour Council since 1995 and Labour Mayor of Newham since 2002 is facing the possibility of deselection by the end of this coming week. Rokhsana Fiaz is standing against him for the Labour mayoral candidacy and the results will be announced on Friday 16 March after local Labour members have voted. Robin Wales is running scared and after decades of promoting policies of social cleansing of working class people, forcing them out of the borough, he now proclaims himself a socialist and a radical. We know that nothing could be further from the truth. If this is the end of the reign of Robin Wales, now is the right time for community groups and campaigns to put maximum pressure on the new Mayor and not let the Labour council off the hook. Focus E15 campaign is endorsing a people’s charter for Newham. It is a work in progress and is intended to spark debate and discussion about what kind of Newham we, the people, want. Focus E15 campaign presented this idea of drawing up a people’s Charter to the prospective Mayor, Rokhsana Fiaz on Saturday 10 March 2018 at her surgery in Custom House. If your group or community would like to endorse the People’s charter please email the campaign and we will add you onto a list focuse15london@gmail.com. Focus E15 campaigners presenting a People’s Charter for Newham to the prospective Mayor Rokhsana Fiaz.